Tech journalist and TV personality Amber Mac was all over Dx3 2015, interviewing founders and senior execs from some of Canada’s top digital businesses live from the Dx3 show floor about the obstacles and opportunities shaping the industry. As a media sponsor for Dx3 2015, BetaKit has been selected to share these interviews, courtesy the fine folks at EY Canada. After three years of building its community-driven marketplaces, VarageSale has begun to receive a lot of attention, raising a $34 million Series B round, and fighting off rumours that the Toronto-based company would move south. 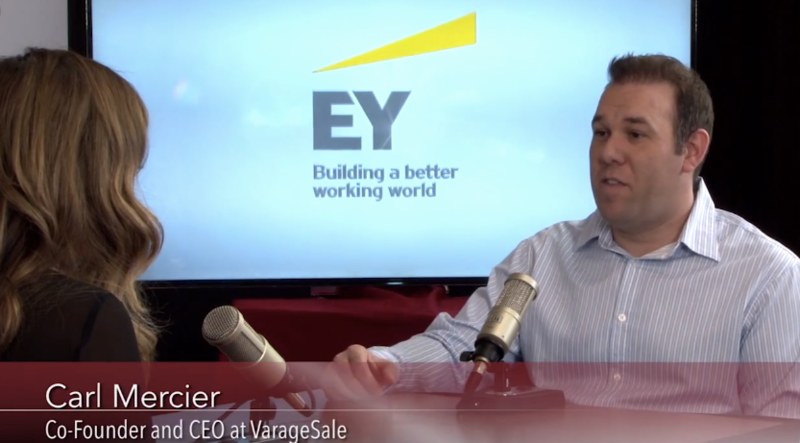 In the video below, VarageSale co-founder and CEO, Carl Mercier, explains to Amber the steps the company has taken to build close-knit communities of people wanting to connect. “People need to use their real identity, their real names, and are approved by local members to make sure they’re trustworthy and live in the neighbourhood,” Mercier says. Of course, the use of real identities online always raises the question of security concerns, which Mercier was ready to address, stating that VarageSale doesn’t store any personal information after validating a user’s name and Facebook account. “We just want to make sure you’re a real person,” he says. Dx3 is back March 2 and 3, 2016 at the Metro Toronto Convention Centre. Interested in having your company profiled on the Dx3 2016 Canadian Tech Spotlight? Fill out this form to apply!